Everybody is getting pumped about the new wave of tech IPOs in 2019 and 2020. These SF Bay Area tech IPOs include Uber, Lyft, Airbnb, Slack, Pinterest, and more. The default assumption is that these tech IPOs will bring in huge demand and drive SF Bay Area real estate prices up. After all, these soon-to-be public companies are worth billions and employ tens of thousands of sub-35 year-old-employees looking to establish roots. If you’re a real estate agent, it’s always a good time to buy or sell property since they make money on transactions. No problem. But I have a feeling the industry is overestimating the impact tech IPOs will have on real estate prices and underestimating the impact tech IPOs will have on a homeowner’s desire to sell. Remember, to get rich, you often need to challenge yourself to think the other way. There are very few “no-brainers” in this world. If there were, we’d all be financially free well before our expiration dates. As with any wild assumptions, it’s good to do some analysis using real numbers instead of hyperbole. Let’s go through an exercise to ascertain what the realistic incremental demand is for housing from tech IPOs. The median home price in San Francisco is about $1.5 million. In the SF Bay Area, the median ranges from around $800K in the East Bay up to $3.1 million in places like Palo Alto. To feel wealthy enough to buy an above average/median home and have money left over to pay for life, let’s assume a $1 million after-tax windfall from the IPO. 99% of the employees are not highly-comped execs, but 35 and under employees making less than $300,000 a year all-in, a middle class lifestyle for the Bay Area. The average employee has been with the company for two years. Given the average startup employee is underpaid on salary due to stock compensation, the average startup employee does not already have a 20% downpayment for a median-priced home. The average employee’s option strike price is higher than zero since the vast majority of employees didn’t join at the beginning. The tax rate on the exercise of options after the IPO lockup period will be approximately 50% total to account for state and federal taxes. For them to become windfall millionaires, they would have to sell at least $2M in options. Of those with this optionality, I suspect only a small percentage will enter the housing market. Let me explain. Let’s say the company IPOs at a $20B valuation. To get $2M in proceeds the employee must liquidate 0.01% (1 basis point) ownership in the company. Now let’s go back to our assumptions. If they’ve been there two years at IPO time and they want their money within a year of IPO, they’ll only have vested 3/4 of their initial 4-year grant, which means they must have been granted 1.33 basis points ownership. Further, given their strike price isn’t zero, even with ballistic growth since joining two years ago, they’ll need an even higher grant than 1.33 bp. Let’s call it 1.5 bp (0.015%). The employee option pool size at this stage is typically around 15%. And of course, they’re not distributed evenly. At a $20B company there are probably 500 – 1000 employees who could end up owning 1-1.5bp on average. So at a $20 billion valuation post IPO, if its value holds in time for employees to sell usually 6 months after IPO, the IPO may yield 1,000 eligible buyers with $2-3 million gross / $1-1.5 million after-tax, assuming they sell ALL their stock. Now multiply these 1,000 people by the percentage of how many will actually enter the real estate market with this money in the ensuing year. If 50% want to buy property, that’s 500 eligible buyers. If 20% want to buy property, that’s only 200 eligible buyers. The intent to buy percentage is certainly not 70% – 100% since some already have property, some don’t want the hassle of owning property, some think property prices are too expensive, and some want to pocket their gains and move away from the Bay Area. A total of $100B in valuation with the same math would produce roughly 5,000 potential buyers with $1-$1.5 million after tax. If we use a 20% intent to buy percentage, we’d yield 1,000 true buyers or 2,500 true buyers using a 50% intent to buy percentage. 1,000 – 2,500 high intent buyers sounds significant over the next couple of years. If we add up the total projected public values of Uber, Lyft, Airbnb, Palantir, Pinterest, and Slack, we’re talking about a total public value of roughly $200B from 2019 – 2020. Uber, alone, is estimated to be worth around $100-$120B. Whether it goes up or down after IPO, nobody knows for sure. Therefore, one can make an educated guess there will be roughly 10,000 eligible buyers and anywhere between 2,000 – 5,000 high intent buyers,resulting from all these IPOs over a two year period. These 2,000 – 5,000 high intent buyers with $1 – $1.5 million in cash after tax are therefore looking for properties worth between $1 million – $7.5 million based on a 20% – 100% downpayment. But how does 2,000 – 5,000 new buyers compare to supply? Ah hah! This is the missing part of the equation people don’t seem to account for when projecting home prices. The SF Bay Area real estate market finally cooled off in 2018. Some tech companies like Nvidia, Facebook, and Apple lost 20% – 40% of their value, even though the S&P 500 was only down about 6.4%. A correction was bound to happen as price growth outstripped wage growth for so many years. 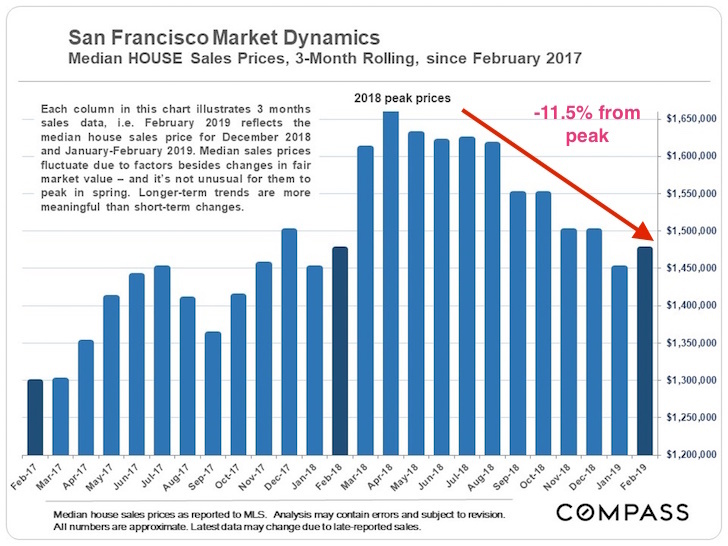 Check out these price and inventory charts by Compass, the largest real estate broker in San Francisco. Notice how the median price peaked in early 2018. At any given time, there are between 6,000 – 8,000 homes for sale in San Francisco. One day in March 2019 there were 7,792 homes for sale in San Francisco, up from 6,233 a year before according to Zillow, +25% YoY. In the San Jose area, there were 3,011 homes for sale one day in March 2019, up from 2,102 the year before. That’s an almost 50% YoY increase in inventory folks. Check out this chart below that shows how the inventory of homes for sale is spiking in the SF Bay Area. We’re at 7-year highs, and the number looks to be going higher as sellers try to cash in. What on Earth is going on with the supply surge? It’s actually pretty simple to explain. 2019 marks the 10th year of a bull market in the S&P 500. Meanwhile, real estate prices are up 80% – 100%+ since 2012. The SF Bay Area population is aging and the area is becoming congested, homogenous, and unaffordable, even for most tech workers. Further, there is a demographic shift away from the SF Bay Area to the heartland of America because costs there are much lower. When you can live in a 2,500 square foot single family home for less than $2,000 a month compared to paying $4,500 a month for a 1,000 square foot two bedroom apartment, while earning a similar amount, the pull to leave is strong. Google, for example, announced in February 2019, it is spending $13 billion to expand into the heartland. If Google, one of the wealthiest companies today, is finding it cost ineffective to pay its engineers $300,000+ because it costs over $3 million to buy a median-priced home in Palo Alto, you know other companies are expanding into the heartland as well. Imagine you’re a homeowner who is up 100% in the past 10 years. Your 20% down payment is up 500%. By all comparisons, you’re rich! And if you owned more than one property during this time period, you’re really feeling lucky. You wanted to sell in 2017 but held off. Then you wanted to sell in 2018, but tech was crashing and the real estate market was weak. With the upcoming new tech IPOs, now is finally your chance to sell to a lucky newly-minted millionaire in 2019 or 2020. You’re praying the IPO surge will lift prices back to all-time highs and then some. Sure, all these new tech company IPOs over the next couple years employ ~35,000 people (Uber ~13K, Airbnb ~11K, Lyft 2K, Palantir ~3K, Slack ~1K, Pinterest ~1K, etc), some of whom will want to buy real estate. But the SF Bay Area has 7.6 million residents, some of whom will want to take advantage of the new tech IPOs and sell their real estate. Let’s say only 20% of the 7.6 million people own their homes since ~15% of the population are kids and there are dual adult households, that’s still 1.52 million homeowners who might want to consider cashing out versus 35,000 new tech IPO employees who might be able to buy. In other words, the ratio of potential sellers to potential buyers is 43:1 in this scenario (1.52M to 35K). Even if we more conservatively assume only 10% of the 7.6 million Bay Area residents own their homes, and there are 100,000 tech company IPO employees all living in the Bay Area, the ratio of potential sellers to potential buyers is still 7.6:1 (760K to 100K). We can drill down further and estimate the high intent to sell sellers out of the 760,000 – 1,520,000 estimated homeowners in the SF Bay Area, which is already a conservative figure. Even if just an additional 5% of SF Bay Area homeowners decide to list their homes over the next couple of years, that’s an extra 38,000 – 76,000 in new supply flooding the market compared to 2,000 – 5,000 high intent buyers based on $200 billion worth of tech company IPO value. Therefore, the ratio of potential sellers to potential buyers still ranges from 7.6:1 to 38:1. Even if we double the high intent buyer count to 10,000, supply still far outweighs demand. Given the lopsided ratios, one could easily conclude a surge in inventory will more than offset the uptick in demand from tech IPO employees. Instead of seeing a step up function in home prices, we could very well see a step function down after the initial frenzy is over. If you still can’t see or believe how prices could go down based on the numbers, here’s a classic Supply / Demand chart to illustrate the point along with my commentary. 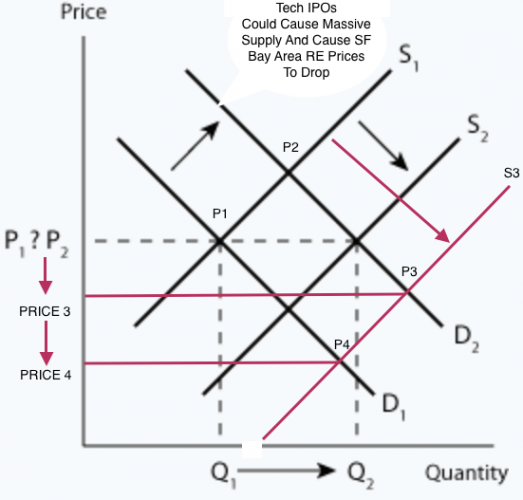 When D2 intersects S3, real estate prices end up lower than during the initial D1 and S1 intersection equilibrium. But things could get even worse given how slowly it usually takes for homeowners to read headlines, contact an agent, prepare their home for sale, and then list their home on the Multiple Listing Service. The Johnny-come-latelies would create even more supply past the new equilibrium, thoroughly overwhelming demand. As the inventory of homes piles up, more price cuts are an inevitability. As prices decline to P4, homeowners, home sellers, and the mass media start to panic, causing even more pricing pressure. This is how real estate cycles form, and partly why a recession might appear by 2021. Time frame: in 20 – 36 months. Just like how there is FOMO for buying, there is FOMO for selling. To not cash out when you had the opportunity might be the worst feeling ever. During the 2000 dotcom bubble, there were plenty of paper millionaires who lost everything because they refused to take profits. During the 2008-2010 housing crisis, SF Bay Area real estate did fall between 20% – 30% (see chart above), with many examples of people losing their homes to foreclosure or short-sales. Surely, many who’ve held on are considering their second chance. When it comes to forecasting where real estate prices are heading, determining supply could be much more important than determining demand. At the end of the day, you should buy a property to live in and enjoy life first. Run the numbers. If you foresee owning your home for at least five years and the cost makes sense after putting at least 20% down, then go ahead and buy. Just know that real estate is seasonal. If you are reading this article in the spring, you will witness the strongest period of demand as buyers get paid their bonuses and commit to their new year’s resolutions. The people who lose their minds, and sometimes their shirts are often buying during the spring. The buying frenzy fades in the summer, picks up again in the fall, and dies down during the winter. Winter is always the best time to buy. Even if the tech company IPOs don’t help boost real estate prices, they should at least provide a floor of no more than a 20% decline from peak to trough. Just be careful thinking that you just can’t lose buying Bay Area real estate today. Please pay attention to monthly inventory numbers. They are already at 7-year highs. The higher supply goes, the stronger the downward pricing pressure. It doesn’t matter how great a property is. If the house two doors down is also trying to sell, your hope for a bidding war is gone. If you want to invest in real estate once you own your primary residence, it’s much better to invest outside of the SF Bay Area where cap rates are 3-5X higher, and valuations are 50% – 80% lower. I truly believe investing in noncoastal city real estate is going to be a multi-decade positive trend. Thanks to telecommuting, video chat, the internet, mobile phones, and new online tools, both companies and employees are moving to cheaper areas of the country. As for what I’m doing with my San Francisco real estate, not much. I already sold one rental property in 2017 for 30X annual gross rent and plan to keep my remaining rental property forever since its paid off. Given I need to live somewhere, I’ll be keeping my primary residence at least until we relocate to Hawaii, where real estate prices are about 30% cheaper. That said, if any new tech IPO multi-millionaires want to offer me $4 million cash for my little home with panoramic ocean views, please leave a comment and I’ll get back to you. Not only did I remodel the entire home, I also installed a wonderful hot tub for you to enjoy after a long day’s work. Readers, why don’t more writers do a supply side analysis when it comes to analyzing real estate pricing trends? How much hype is caused by the media What do you think is more important when it comes to prices: supply or demand? 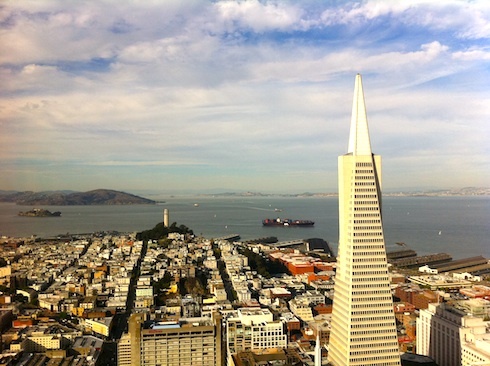 How do you think the upcoming tech IPOs will affect SF Bay Area real estate prices?